The city of London, the very heart of the economy in the UK. We have 20 years experience of working in the city centre. There is nothing more fulfilling than to have completed our cleaning duties just as the sun is setting upon St Paul's Cathedral in the early evening of the summer time. Your office is located in one of the most popular postcodes in the country. Let us put our passion for cleaning & London into your office and just see the results. 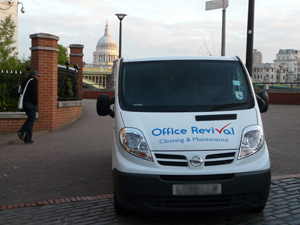 We are Office Revival and are available on the following freephone number 0808 120 3830.